The purchase of the Argos Extreme Gear Bag Combo includes the "Argos Extreme Dry-Gear XL Back Pack" and the "Argos Extreme Gear-XL Duffel Bag"
The "Dry-Gear XL" BACKPACK is a fully dry bag that will keep your dry stuff dry or your wet stuff from getting everything wet. This large bag has a bi-fold Dry Lock closure that, unlike other "dry" bags, keeps water from slipping through the seal. Made of extra thick waterproof PVC Tarpaulin material, this bag will hold up to your heaviest loads. The Dry-Gear XL has fully adjustable high-density foam padded shoulder straps, a waist belt, and a semi-ridged padded back panel for heavy loads. We've included adjustable webbing tie downs, that can be used with the gear attachments on the sides and front of the pack, to secure your dive fins or gear. Other features include a semi-dry front pocket for smaller items (it will stay dry as long as the bag is not submerged), four side compression straps, additional strap closure to secure the main opening, gear attachments on the shoulder straps and heavy-duty bottom feet to protect the bottom of the bag. If you also purchase the "Gear XL" dive bag, you can attach (by way of the compression straps) the dive bag to this backpack. You will have the best of both worlds; a dry backpack for everything you want to stay dry, with an attached dive bag for your dive gear. Just put everything on your back and go! The "Gear XL" DUFFEL BAG is the last dive bag you will buy. At 42 inches in length, it will fit any size Freedive fins leaving tons of room for all your other gear. Built with heavy-duty mesh, waterproof PVC Tarpaulin, cross hatch stitching at all pressure points and large no corrosion plastic zippers, Argos has built this bag to last. Mesh allows the bag to breathe but the bottom of the bag is waterproof PVC so that your wet gear won't leak through. 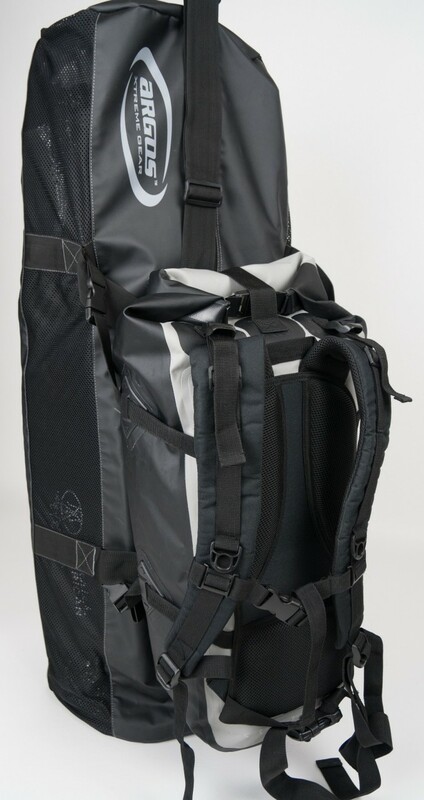 Gear XL can be carried like a normal duffel bag (by the handles or shoulder strap) or, because of the extra-long handles, they can be used as shoulder straps to backpack into your favorite dive spot. If you also purchase the "Dry Gear XL" dry backpack, you can attach (by way of the removable compression-strap snaps) this bag to the backpack. You will have the best of both worlds; a dry backpack for everything you want to stay dry, with an attached dive bag for your dive gear. Just put everything on your back and go. This bag also features a semi-dry (it will not get wet unless submerged) pocket on the end of the bag and an internal mask/snorkel pocket. This mask pocket is designed to fit your mask with attached snorkel keeping it from falling to the bottom of the bag to be damaged. It allows you to place it on top of your other gear once the bag is loaded. We think you'll agree, this is the last dive bag you need to buy. Click the button below to add the Argos Extreme Gear Bag Combo to your wish list.